I'm looking for a new canoe. The Wenonah heron has caught my eye. It is short but 2 seats. Seems manageable as a solo as well and is fairly light weight. I need something that is easier to manage by myself when Karen and I go out. The green bean is about 80 lbs and I need something lighter. HELP. We had a Wenonah 17' Wenonah model for a time. Construction and materials were top notch. It was a pretty good river canoe and we used it on several western Montana rivers with good results. It turned well and was stable unless overloaded. The Heron looks to be a good design for about anything short of hauling really large loads. The last few years we have had a 14' two person canoe and only use it on the reservoir on our farm so my experience with it in moving water is nil. 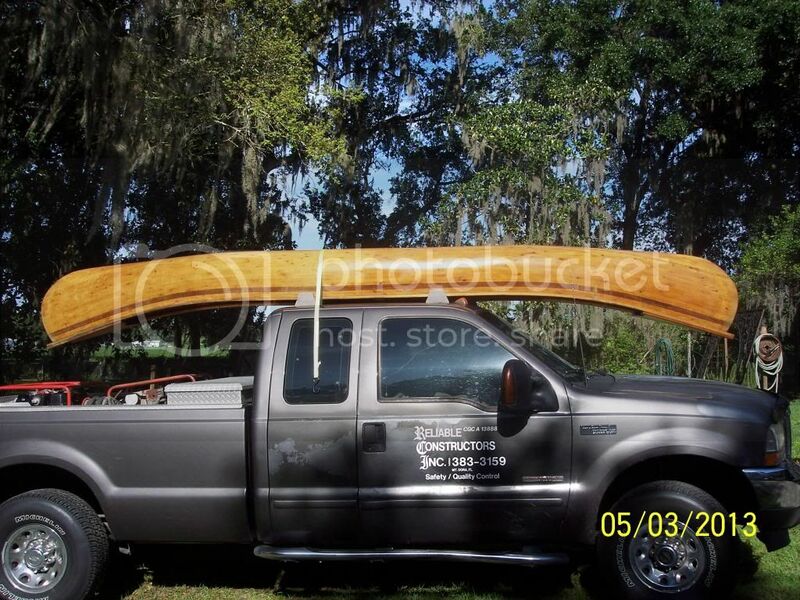 I can tell you that the 14' canoe is adequate for two people fishing and paddling around the reservoir and the lighter 16' Wenonah would be better in all regards. I like the layout of the basic model better than the Kevlar models (simply the lack of the aluminum cross pieces) but that 36 pounder would be a joy to have. You can hardly go wrong with a Wenonah. The Heron looks good for what you say you're looking for. Less weight. Day tripping tandem. Maybe solo overnight (Just sit in the bow seat backwards). Store out of the sun. 36" width will be stable. No blue ribbons at the local races but that's not what you're looking for. It certainly won't be behind the pack! I've been jonsin' for a Wenonah for years. I'm still saving that Kevlar Wenonah Solo Advantage for you, Tony. Stop by at your earliest convenience. Okay, not the answer you're looking for but hear me out. You know I'm a cheap S.O.B.!!! There is a proven method of building very cheap and extremely tough long lasting boats out of foam. This is the newest method called PMF, Or Poor Man's Fiberglass. Do I have you're attention yet? Here's the process short and simple. gorilla glue your layers of 2" pink foam together. Shape it in the desired hull design. Coat the whole thing with tightbond II diluted 50% with water. Lay your cotton bed sheets on there and squeegee the air pockets from the center out. Let it cure then paint it your favorite color. Now it's finished go play. At 7' wide, 8' tall, and 12' long will cost me $500. A small canoe should be less than $50 and about 5 hours build time. Here's some proof of concept. LOL! This is interesting and hilarious at the same time! Does the foam have to be pink? You gotta admit that it's an easily workable and CHEAP way to end up with any hull design that your heart desires, though! Great post, xj! Does the foam have to be pink? No, it does have to be xps. expanded polysterene foam. It comes blue sometimes. I hear this can be hard to find in southern states but it can be ordered and shipped to store. I was ready to build an Airolite and then I got a dog. I figured a dogs toe nail or fish fin would poke a hole in it. It appears to me these are too fragile for heavy use or wanting to get back to where you put in with a reasonable chance for success. I believe the airolite boats use the same covering method as airplanes. dacron and dope. Titebond II dries into a hard plastic like surface. It could be possibly stronger than the doped dacron. I bet a 2 layer skin of cotton bedsheet on that same frame would be nearly indestructible and nearly as lightweight. A couple of coats of exterior acrylic latex paint or water born varnish are the simplest. HMMMM, This is getting interesting. Who'll be the first to build something? I want to buy a boat... not build one... I do appreciate all information though. Have used a 17' Grumman alum. canoe for many, many years.....78#..
A young man can portage, with portage bar alone pretty easy. Not tippy, low pointed ends (doesn't catch wind as much)..so one person can handle it with a cooler for balance. Puts up with a 100 pound lab going nuts and baling out....as well a a noobie that shifts his weight around waaaay to much. Friends paddle around in their shiny fiberglass, Kevlar and look really good.....The come hunting and river running with me. This one is about identical to mine. Yeah, I've got 2 Grumman aluminums. One is 44 years old to me. Mom bought it used. Still going strong. My complaints about aluminum are. 1. Loud. You can't help it. I can hear your paddle hitting the gunnel 4 bends away. 2. Cold. Remember the Christmas Story scene of the kids tongue stuck to the flagpole. And southern folk really don't understand the saying, "Freeze your azz off." like when you paddle in the winter on that metal seat. 3. Keel. Most of them have a keel that protubes downward right down the centerline. Needed for strength. Good for tracking. But drift over something sideways and you going to get a jolt when it catches. Still. There's a bunch of them out there and they sometimes sell at a "I just want it out of the yard." price. I still paddle mine a couple times a year. I know bud, I just like highjacking threads! I get e-mails from paddling.com. This was on there. 27-30lb adirondack style. I loved my aluminum canoe. I gave it to my son in law and he loves it. He's also 31 and can handle the 80ish lbs better than me. I kept the greenbean cause it's 12 lbs lighter. Right at 70 lbs. I'm hoping find something in the 45 ~ 55 lb range that can take rocky rivers that we have around here. Also hoping to keep it under 2500$. Great site there xj. Lots of boats. Don't be afraid of Kevlar composites on your rivers. They're pretty strong. Of course not the ultra light ones. But they paddle expeditions in Kevlar. They wouldn't if they broke easily. I have 3 composite kayaks that I beat the chit out of in SE whitewater that's known to be bony. You should be able to find what you're looking for. Google stuff like VA paddling clubs. You might find a lightly used one someone is selling. That is such a classic design. Oh I'd love to have it but I can't collect canoes. My honey indulges me enough and is on board for a really good new boat. I just got to figure out the best one for us. creek how bout a folding deer cart or used golf caddy you will need a long exstention pole though. Around 50lbs. Thanks she rides real nice. I don't have much experience with different models but one company I have oogled at is the Swift Canoes. They just look sweet and folks seem to love them. You might give them a browse creek. They make quite a few models. How's the search going creek? Sorta been set on the back burner. Trying to get some trees close to the house removed and a patio built. Can't get anybody to do . Been putting some $ in my truck too. Wenonah is putting out some new models with a new light weight material kinda like my Mohawk shortly so we're kinda waiting on that as well. We'll get it sorted out.